A property interest gives rights to a land owner but also implies restrictions or imposes responsibilities which may impact on their use or enjoyment of the land. For example, whether a property is heritage-listed or located on a contaminated site. To learn more about property interests that exist in Western Australia, search the interest dictionary, at no cost. 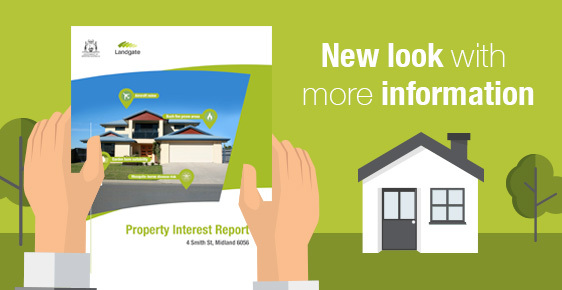 Find a list of interests currently available in the Property Interest Report (PIR). confidence that you have done your research. knowing which government department to contact for more information. Find answers to your most common enquiries about a property interest report. What is a property interest? A property interest gives rights to a land owner but also implies restrictions or imposes responsibilities which may impact on their use or enjoyment of the land. Most interests are created by government legislation, policies and guidelines. Refer to our free interest dictionary for more information about known interests. What is the interest enquiry service? Landgate's interest enquiry service gathers interest information from multiple government bodies and private organisations in Western Australia and consolidates that information into the property interest report. This report will show interests that do and do not affect a property, as well as interests that may impact your current or intended use and enjoyment of a property. A Property Interest Report provides detailed information about an interest and its impact on a subject property. A property may be affected by just one, or by several interests. Information retrieved includes the legislative basis for an interest and the impact of an interest on a subject property. Why do I need a Property Interest Report? A property owner in Western Australia is entitled to use their land in any manner they please; however, it is subject to, among other things, rights, restrictions and responsibilities that are often imposed by legislation. A Property Interest Report helps buyers, sellers and their real estate sales representative, discover interest information that specifically relates to a property of interest. Are all interests shown on a Certificate of Title? No. Only interests that are registered with Landgate are recorded on a Certificate of Title. These types of interests include mortgages, leases, memorials, easements and covenants. Under their own legislation, some government agencies are not legally obliged to register their interests with Landgate. These types of interests relate to heritage, the environment, land use planning, energy safety, mining and there are many more. How can I identify all interests for a particular property? A Property Interest Report is a good starting point to discover interest information relating to a property. Landgate does not have access to all known interests affecting property in Western Australia. However, the report clearly identifies those interests that it does not have access to and provides the details of the relevant government agency to contact for more information. Should I also order copy of a Certificate of Title? Yes. It is important to obtain a copy of a Certificate of Title and survey to verify interest and other information, such as easements and covenants relating to land use. A Property Interest Report provides a definition of each property interest, the relevant legislation and the contact details of the government department responsible for the information. If you have a query regarding a property interest, contact the relevant government department. What is the interest dictionary? The interest dictionary is a free online service that contains a list of known interest types, custodian agencies, definitions of interests and interest legislation. It is an opportunity to learn more about a particular interest. For more detailed interest information you will need to contact the relevant custodian agency. What if I find incorrect information in my report? If you find information in your report is inaccurate, please contact the responsible agency for more information. Landgate produces and sells the report but the information comes directly from multiple government departments.